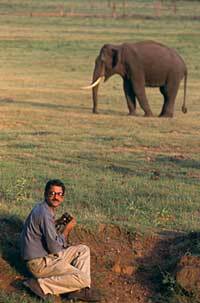 As ecologist, Sukumar has studied elephants for 41 years. He grew up in Madras, and at the age of 15 Sukumar became interested in ecology and conservation, and spent more time in nature. His grandmother used to call him vanavasi (the Tamil word for "forest dweller"). Sukumar studied botany at university and by then he had decided to become a conservation scientist. Years of studying elephants in the wild in the late seventies, as well as writing three books on elephants and over fifty scholarly publications in the area of biology, makes him one of the most important authorities on asian elephants ever. Graduated from the University of Madras with bachelor's and master's degrees in botany. 1988 to 1996: volunteer Deputy Chair of the Asian Elephant Specialist Group of IUCN (World Conservation Union). 1997 to 2003: Chairman of the Asian Elephant Specialist Group of IUCN (World Conservation Union).